Baked Buffalo Catfish is an easy weeknight recipe. Heat oven to 400 degrees, and grease two baking sheets. Mix together the flour, garlic powder, paprika, onion powder, salt, and cayenne pepper in a medium bowl. Pour the buttermilk in a second medium bowl, and the Cornflakes into a third medium bowl. 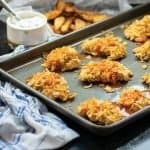 Place each piece of catfish (one at a time) in the flour mixture, then the buttermilk, cover it in cornflakes, and place it on the greased baking sheet. Bake the catfish for 20-25 minutes, or until the largest piece is flaky. Melt and stir the butter into the hot sauce in a small pot over medium heat. Mix together all of the tartar sauce ingredients, and refrigerate until ready to serve. Serve the catfish with the buffalo sauce drizzled on top or on the side.